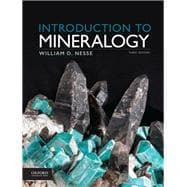 Introduction to Mineralogy, Third Edition, consolidates much of the material now covered in traditional mineralogy and optical mineralogy courses and focuses on describing minerals within their geologic context. Presenting the important traditional content of mineralogy--including crystallography, chemical bonding, controls on mineral structure, mineral stability, and crystal growth--it provides students with a foundation for understanding the nature and occurrence of minerals. Introduction to Mineralogy can be packaged with Daniel Schulze's An Atlas of Minerals in Thin Section for use in your course for a nominal additional fee. William D. Nesse is Professor Emeritus of Geology at the Department of Earth Sciences at the University of Northern Colorado. Each chapter opens with an Introduction and ends with References Cited and Suggestions for Additional Reading.